A College going culture requires the students, the parents and the school faculty/staff to share the same message about post secondary education. Keeping the students at the top of the triangle the parents and school faculty support and lift the student to their potential. The student learns skills about being successful, career options, college readiness, financial literacy, competitive eligibility, the application process and eventually the best fit on decision day. Parents play an important role in supporting their student and the school as part of the college going culture. Parents will review their own educational journey, learn the college systems, research resources and facilitate college readiness conversations at home with their students. 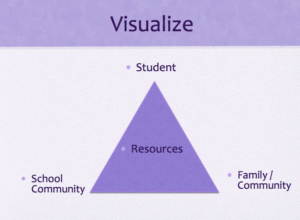 The third part of the triangle is the school, faculty/staff. All should hold a high expectation for all student achievement and success. The more faculty and staff know regarding college and career options the more normalized the conversations become in the classroom. Additionally, for many it has been a number of years since they were a high school student preparing for post secondary studies. Many took different paths to complete their post secondary education. Classroom conversations about teacher experiences, posting their photo, alma mater and major within the classroom, and normalizing the post secondary process within their work with students, further supports the students knowledge base about college. Finally school events, and field trips that include some aspect of post secondary education through out the academic year. This can include events such as career day, attending college fairs, campus visits, college tee-shirt day.